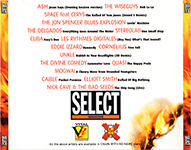 This compilation released with Select magazine in December 1998 is actually a mean of promotion for the Vital distribution company, hence the serial number SELECTVITAL 02. It features only tracks selected from their catalogue, including The Divine Comedy’s ‘Commuter Love’. Other artists include Ash, Elliott Smith, Nick Cave & The Bad Seeds, Stereolab, Jon Spencer Blues Explostion, The Delgatos and mainly electronic stuff from that time. The back cover features below the Select logo, both Vital and Chain With No Name (a selection of record shops where Vital’s catalogue was available) logos. The booklet features some notes from the magazine editor, John Harris, and inside publishing credits for each song. Notes from the artist about each song were to be found inside the magazine.